Blue Apollo began in Harlem during a month-long stay September 1998 at a (not “the”) Chelsea hotel, whence I could begin research for a series of New York paintings while also visiting museums at leisure. We’d just emerged from the Studio Museum, down the street from the Apollo Theatre, when the blue man in white moon boots stepped in front of my camera. 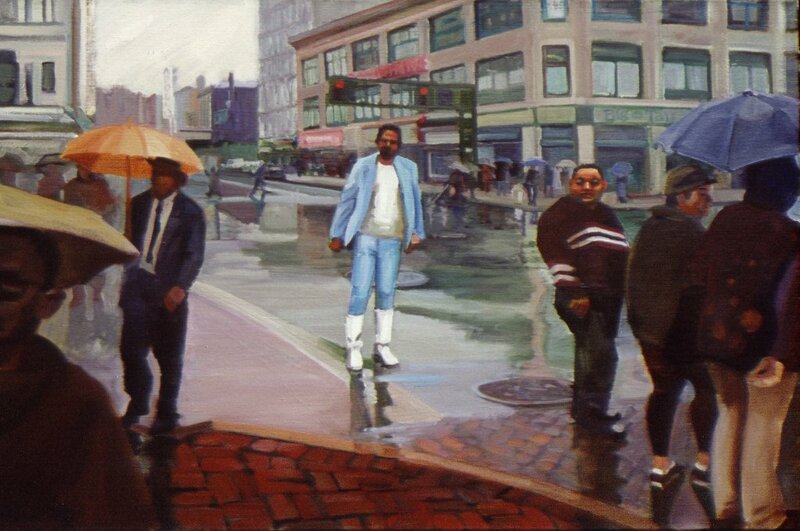 Other figures in the painting, the man with the yellow umbrella, the guy with the horizontal stripes on his chest, the two women in the right corner, were found nearby. Unfortunately, no finally satisfactory photographed material showed up for the left corner but I “completed” the painting anyway, and since our grandson Jesse liked it, the work accompanied him as he moved about Seattle, hanging it on various walls as his career and family life changed and grew.